From Mission Bicycle Company comes a crime procedural of theft and recovery. It's a parable with a strong moral because the Valencia Street hand-built bicycle company would like you to please register your bike. Doing so, they argue, increases your odds of getting it back in the event of a theft like this one. And hey, if you blew $800 on a custom Mission Bicycle Company single-speed, then you should probably go ahead and do that. Their bikes start at $766, for the record. The bike in question, which seems to have belonged to the store, was leaning against a bike rack for "just a second" when it was nabbed back in December. On the 15th of January, it was posted to Craigslist. (Sidebar: That lag time, which goes undiscussed in the Mission Bicycle Company blog post, is a little fishy to me, and might imply that the bike had changed hands... or not.) Regardless, the Craigslister goes by Shawn-Paul, and he lists the bike's specs to a T, basically making it look like his. Probably because the original theft had been publicized on social media, a Good Samaritan named Mina Hughes flags @stolenbikessfo, a Twitter entity that lists stolen bikes. 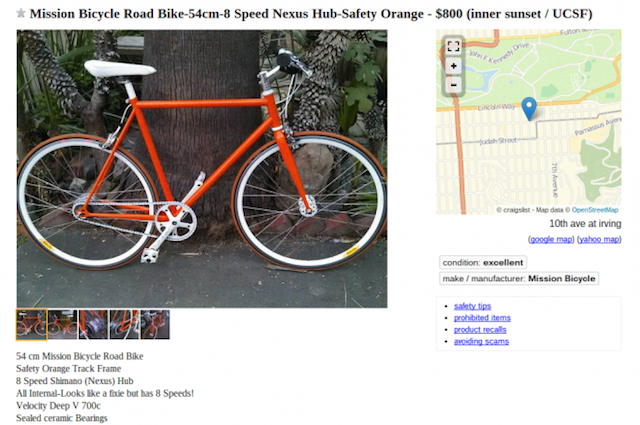 On the 16th, the day after it was posted to Craiglist, Mission Bicycle Company takes action. "Our friend Bryan who helps run Bike Index (and its associated twitter @stolenbikessfo) responds to Mina and then shoots us an email. The bike was registered with Bike Index so it was easy to track. Moral, register your damn bike!" Noted, guys. The team then emails Officer Friedman of @SFPDBikeTheft to loop in the blue. Next, they feign interest in the bike on Craigslist and set up a meeting with the seller, Shawn-Paul. They meet up, the bike in tow, and at 1:09 p.m., "Shawn-Paul arrives with the bike and within seconds the SFPD make it a party and recover the bike." So yes, the registration here helped. It probably didn't hurt that the injured party, Mission Bicycle Company, is very much a part of the bike scene. Nonetheless, here's their guide to bike registration, which certainly can't hurt and really does stand to help. The more in-use this system becomes, the more it stands to benefit all us city cyclists.